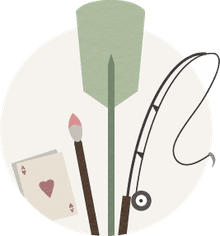 Lisa Marder is an artist and educator who studied drawing and painting at Harvard University. She is an instructor at the South Shore Art Center in Massachusetts when she is not working on her own art. Simultaneous contrast is a visual phenomenon that refers to the way we perceive the effect of two adjacent colors or values on each other. Colors do not exist in isolation; they are affected by their context and exert an influence on neighboring colors. According to the Merriam Webster Dictionary, simultaneous contrast is "the tendency of a color to induce its opposite in hue, value, and intensity upon an adjacent color and be mutually affected in return. By the law of simultaneous contrast a light, dull red will make an adjacent dark, bright yellow seem darker, brighter and greener; in turn, the former will appear lighter, duller and bluer." Simultaneous contrast also holds true for value, one of the three main characteristics of color, the others being hue and saturation. White appears whiter when placed next to black, and black appears blacker when placed next to white. The same gray value line going through a scale of changing values from white to black will appear lighter or darker depending on the adjacent value. What does “simultaneous contrast” mean? by Richard McKinley (July 30, 2007) on Artists Network demonstrates an example of this and for further explanation of simultaneous contrast. Learn more about the theory of simultaneous contrast in The Principles of Harmony and Contrast of Colors and Their Applications to the Arts (Buy from Amazon), in this seminal book on color theory by 19th-century scientist and color theoretician M.E. Chevreul, Edited by Faber Birren (reprinted 2007). Simultaneous contrast is particularly strong when opposites are placed next to one another, as in black and white (versus different values of gray). So, too, complementary colors (opposite on the color wheel) placed next to one another appear brighter and more intense; for example, green appears more intense next to red and red appears more intense next to green; blue appears more intense next to orange, orange appears more intense next to blue. Hans Hoffman's painting, Equinox (1958), demonstrates the relationship and intensity of the adjacent complementary colors create a push and pull of space as the viewer's eyes focus on the contrast of the colors. Simultaneous contrast is enhanced by proximity and by saturation. The closer the adjacent colors are to each other, and the more intense they are, the greater the effect of simultaneous contrast. The effect of simultaneous contrast is mitigated if a neutral-colored buffer is placed around one of the colors. Simultaneous contrast is enhanced when adjacent colors are highly saturated; simultaneous contrast is weaker when adjacent colors are less saturated or more neutral. A saturated color will look even more so next to a less saturated color; a less saturated color will look even less so next to a highly saturated color. A color will influence a neighboring color’s hue such that the neighboring color takes on some of the hues of the complement of the first color. A color will appear more intense and lighter against a black background. A color will appear less intense and darker against a white background. 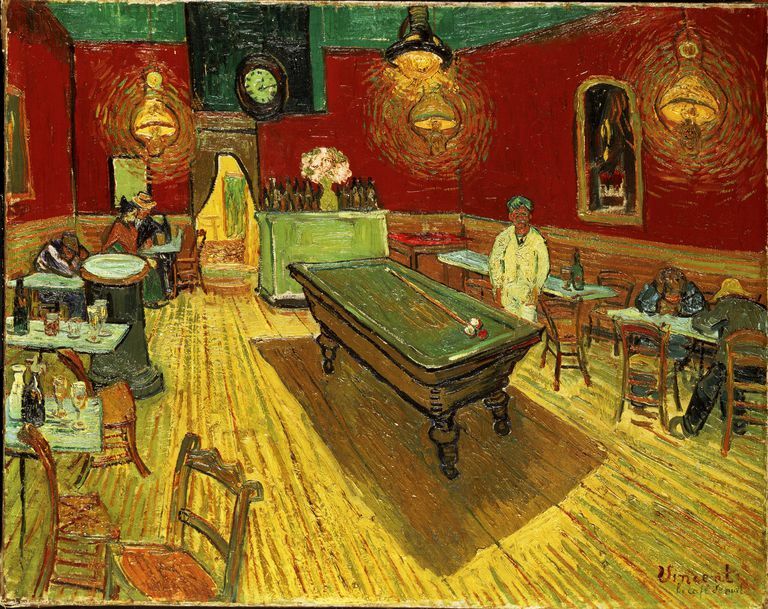 Vincent van Gogh's painting, The Night Cafe (1888), displayed above, has intense complementary colors of red and green that create a jarring effect through simultaneous contrast. Van Gogh said in a letter to his brother, Theo, that he was trying to convey "the terrible passions of humanity" through the use of clashing colors. The contemporary artist Wolf Kahn uses bright complementary colors adjacent to one another to create the effect of simultaneous contrast, which contributes to the vibrancy of his paintings. Henri Matisse was a master in creating simultaneous contrast through his use of complementary colors. As a Fauvist painter he used bright colors expressionistically to convey emotion in his paintings. Placing a color next to its opposite--in hue, value, or saturation--intensifies the effect of simultaneous contrast. The less the contrast, the less the effect that the two adjacent colors have on each other. To make a light color look lighter, place a darker color next to it; to make a warm color look warmer, place it next to a cooler color; to make a color look more intense, place it next to a less intense color. The Impressionists used the concept of simultaneous contrast in their shadows. Rather than making their shadows darker, they used saturated color in their shadows, mixing in the color that was the complement to the color of the light with the color of the surface on which the shadow was cast. They would mix blues and violets (opposite the orange and yellow color of the light) into the color of their shadows. To make a color look more intense, place it against a black background; to make a color look less intense, place it against a white background. The use of chiaroscuro, extreme use of modeling and value contrast to show form, is also an example of simultaneous contrast, with the dark colors appearing darker against the light, and vice versa. Simultaneous contrast is one reason paintings from life are different than paintings done solely from photographs taken by the camera. What our human eyes perceive is very different from what the mechanical lens of the camera "sees." Not only are we able to see nuances of value better than the camera, but we see the effects of simultaneous contrast, whereas the camera only captures the actual color created by the physics of reflected light. So while it is helpful to use a viewfinder to isolate a color in order to identify it and paint it, it is also useful to remember how we perceive color and to bring the concept of simultaneous contrast into your own painting by infusing your color with some of the complement of the adjacent color. What Is Simultaneous Contrast in Art? Why Are Complementary Colors Important in Painting? Does the Light in Your Painting Reveal Your Artistic Identity? What Are Tints, Tones, and Shades? How Do I Mix Cream Colors?